This weeks Divided Government Monday Meme Momentum Monitor delivered on Tuesday, which is a slight improvement over the inaugural edition delivered Wednesday last. 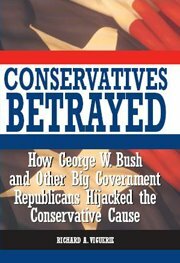 Topping the Divided Government news last week was publication of Richard Viguerie’s new book, Conservatives Betrayed: How George W. Bush and Other Big Government Republicans Hijacked the Conservative Cause. Viguerie's conservative credentials are unassailable, and he is often referred to as an architect of the Reagan Revolution. In this book he asks this very reasonable question "How can Bush, (Dennis) Hastert, (Bill) Frist and company look us in the eye and tell us they are fiscal conservatives when in five short years they increased the already-bloated government by more than the budget for the entire federal government when Ronald Reagan was assuming office?" The answer is left to the reader as an extra credit homework assignment. Viguerie says conservatives should not fear the loss of Congress in 2006, since the biggest gains usually follow a defeat. ...Viguerie helped transform American politics by pioneering the use of direct-mail fundraising in the political and ideological spheres. Dubbed by some as the "Funding Father of the conservative movement," Viguerie motivated millions of Americans to participate in politics for the first time. "If ever there was a case for divided government, here it is," writes Viguerie. "The lesson for many Americans is that today's Republicans cannot be trusted with the keys to both the executive and legislative branches of the federal government." Amen and Amen and Amen! Republicans need to wake up. Let me remind you, listen to any of Bush's state of the union speaches and you will hear a socialist speaking for at LEAST the first half of those speeches... Viguerie compares spending by the federal government, adjusted for inflation, during the Clinton years vs. the Bush years. In Clinton's first term, federal expenditures rose 4.7 percent. In his second term, they rose 3.7 percent. In the first term of the Bush administration, however, spending rose 19.2 percent. "If ever there was a case for divided government, here it is," writes Viguerie. "The lesson for many Americans is that today's Republicans cannot be trusted with the keys to both the executive and legislative branches of the federal government." Other recent Divided Government posts from around the blogsphere. 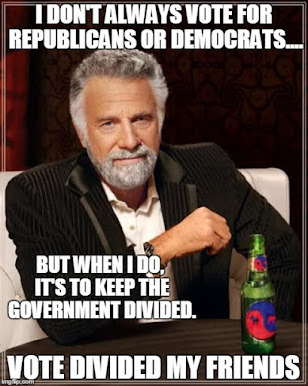 By Lee Cullum, KERA Commentator posts in - "Bayh-Warner"
The main argument Bayh-Warner could mount, however, is that even conservative economist Milton Friedman now says that divided government works better than turning it all over to the same party. He told Charlie Rose that he prefers a Republican in the White House and a Congress controlled by Democrats. But if the GOP still leads the House and Senate in 2008, then a plausible campaign could be waged for the importance of checks and balances in the Oval Office. No one could do that more effectively than Evan Bayh and Mark Warner. Everything I've read says the House is definitely headed for a change. Can you say "Speaker Pelosi" (and from a strictly selfish blogging perspective, it would be wonderful)? And given my desire for a split Congress, the House in Dem hands is fine. They will, and I can almost promise this, self-destruct within the 2 years they have it prior to '08.... I'm of the opinion that the margins of loss are going to be much greater than the Republicans believe and that they are going to lose the House. But specifically I'm not ready, quite yet, to give the Senate to them. Like I said I want a divided Congress. 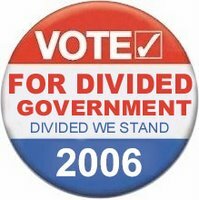 Check out "Divided We Stand. United We Fall." This blog is right on target with its desire and push for a divided government. 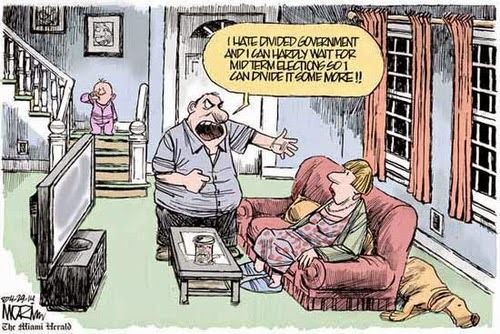 A divided government leads to gridlock and limits the power of the government as a whole (a very good thing in my mind). Plus, if you are a true conservative Republican you should vote for a Democrat this fall. Why? For the simple reason that if the Democrats take back part of the federal power the Republicans will have an incentive (or as true conservatives like to say "essentive") to act like good conservatives. It is a political thing! It is essential that the Democrats take control of at least one part of Congress (I am thinking that the House is most likely) this fall. "This guy is on to something."